What is sustainability? Much has been said about the terms `sustainability' and `sustainable development' over the last few decades, but they have become buried under academic jargon. This book is one of the first that aims to demystify sustainability so that the layperson can understand the key issues, questions and values involved. Accessible and engaging, the book examines the `old' sustainability of the past and looks to the future, considering how economic, ecological and social sustainability should be defined if we are to solve the entwined environmental, economic and social crises. It considers if meaningful sustainability is the same as a `sustainable development' based on endless growth, examining the difficult but central issues of overpopulation and overconsumption that drive unsustainability. The book also explores the central role played by society's worldview and ethics, along with humanity's most dangerous characteristic - denial. Finally, it looks to the future, discussing the `appropriate' technology needed for sustainability, and suggesting nine key solutions. `Sustainability' may be the most important word in our language, and also the most misused. This brilliant, deep, accurate, well-referenced book should do wonders to rectify that. It should be required reading for every high-school student, CEO, and politician. Demystifying Sustainability bids the modern world to abandon magical thinking. It provides just what the world needs most in its time of gathering crisis - a viable, alternative way-of-being that both celebrates the full spectrum of human potential and accurately represents the biophysical realities within which the human animal must function. Haydn Washington brings wide reading and experience, plus a sharp mind and sharp knife, to cut away the obfuscation and denial that mystify the discussion of sustainability. The book is accessible without any "dumbing-down", and does not evade the difficult questions of overpopulation, overconsumption, deification of growth, and overconfidence in the ability of technology to substitute for morality. Highly recommended. Washington boils down the 300 definitions of sustainability to distill the potent essence of the term, and then applies it to point us in the direction of a better future. We want a future that is not only sustainable, but also desirable - a future that allows a prosperous and equitable economy embedded in a harmonious society that remains within planetary ecological boundaries. Our current `growth at all costs' system and its trajectory are neither sustainable nor desirable. Haydn Washington has provided a powerful demystification of sustainability and a guide to the future we really want. It is hard to have a serious discussion about a subject as important as sustainability when we don't even agree on what it means. Harder still if we don't even know that we don't agree on its meaning. 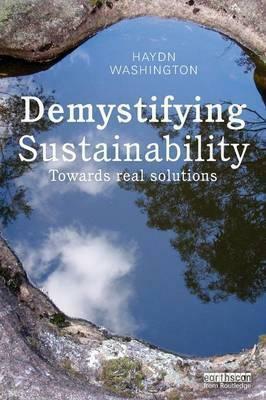 Haydn Washington understands this difficulty only too well and his book succeeds grandly in demystifying sustainability. This book does not beat around the bush. It does not talk in circles. It does not pretend that sustainability is so difficult to grasp that it cannot be achieved. Nor does it pretend that it can be achieved by following business-as-usual trajectory. It does name problems by their name. It does ask difficult but necessary questions. It does propose real solutions. This book is a must read for everybody, in both so-called developed and developing countries, from students to policy-makers. `Sustainable' must not remain merely an undefined buzzword of our time. The human predicament requires widespread understanding that humanity is in serious trouble because we have overshot this finite planet's sustainable human carrying capacity. Only by immediately outgrowing the `endless growth' myth can we avert a fatally calamitous future for our species. Sustainability and spirituality are the double helix of our future wellbeing. Rekindling a sense of wonder in our natural environment is essential for the quality of life of our increasingly urbanized society. This book lives up to the promise of its title and goes a long way towards demystifying sustainability for a broad audience. Haydn Washington has nicely deconstructed the dominant economic paradigm that is driving us toward global collapse. Alternatives are clearly explained through a tool kit of out-of-the box thinking that could save us from ourselves. I recommend it to all who care about a quality future for life on Earth. Haydn Washington is an environmental scientist and writer of 40 years' experience. He is a Visiting Fellow at the Institute of Environmental Studies at the University of New South Wales, Australia.